Strawberry (Fragaria x ananassa) is a favorite among perennial fruit crops due to its aromatic and flavorful berries. Strawberry plants do not produce a true berry, but rather an aggregate accessory fruit. Interestingly, the true fruits of strawberry are the tiny “seeds” that stud the red flesh. Modern strawberry is a cross between F. virginiana and F. chiloensis and are categorized as being June-bearing, day-neutral, or everbearing. 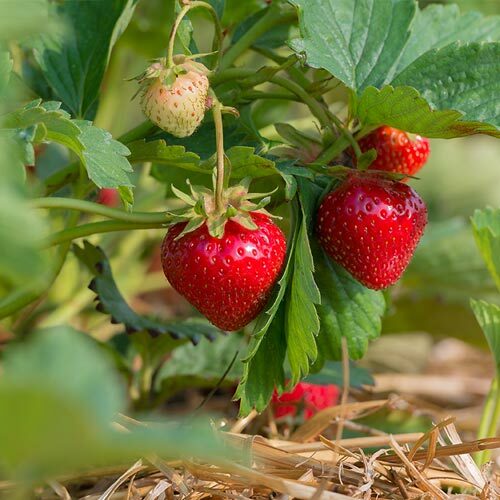 June-bearing strawberries develop overwintering flower/fruit buds in the late summer/fall, when daylength shortens and temperatures begin to cool. These buds overwinter, flower, and fruit during a concentrated period in June the following year. Day-neutral strawberry develops flowers and fruits without regard for daylength and thereby have an extended period of harvest. Everbearing types are similar to day-neutrals, except their harvest season is limited to early and late summer. Comprehensive production guide for organic strawberry production. Review of strawberry production for the conditions of the Northwest and Intermountain west. General guideline for plant and pest management.